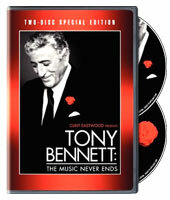 Tony Bennett: The Music Never Ends (Warner, available now), a rich and well-mounted musical documentary focusing on the famed American singer, marks the latest collaboration between filmmakers Clint Eastwood and Bruce Ricker. The two have worked together for some 20 years, ever since Eastwood exec produced 1988’s Thelonious Monk: Straight, No Chaser, which was produced by Ricker. Since then, Ricker has been a music consultant on such Eastwood films as The Bridges of Madison County and Mystic River, while Eastwood has produced the Ricker-directed doc Budd Boetticher: A Man Can Do That and been the subject of an American Masters installment that Ricker also directed. For The Music Never Ends, Eastwood and Ricker, president and founder of the venerable jazz home entertainment label Rhapsody Films (www.rhapsodyfilms.com), opted not to chronicle Bennett’s life and career in the manner of a straight-ahead bio-pic, but rather to fashion a not-necessarily-chronological look at Bennett’s musical heritage. Ricker is also fast to point out that access to clips of a certain pedigree isn’t the only advantage to working with the legendary Mr. Eastwood. - Posted by Laurence Lerman on November 13, 2007. Click here to view the article on Video Business.